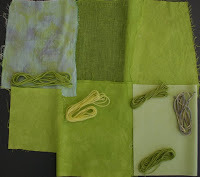 A requirement of this module was to colour and dye your own selection of fabrics using whatever mediums were available to you. The only fabric dyeing I'd ever done before had been years ago at a 2 day workshop where we discovered after 2 exhaustive days that the dye powders were past their use-by date and effectively "off" .... and so I went home armed with an assortment of fabrics and threads you could only describe as the colour of dog diarrhoea. Hence I'd never bothered to try it again ... but C&G called, and I had to bite the bullet and have a go - on my own! I started with the stock standard Dylon cold water dyes. 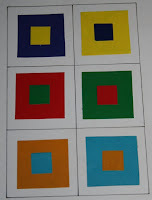 I bought the 3 primary colours, then divided them up to create the secondary and tertiary colours. It was a mammoth job to calculate the dye, water and fabric volumes and I've possibly gone wrong somewhere because the tertiary colours didn't work out as I'd expected. Instead of a lovely purple I got a plummy-brown and so on, but it was a good lesson. 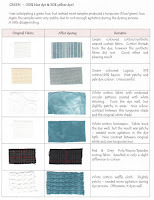 Above and below are a few of my sample sheets. 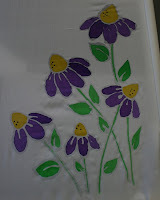 I then attempted silk painting. I say attempted because it was my first go at this technique, and although I'm quite pleased with it, I recognise that I've a lot of improving to do. 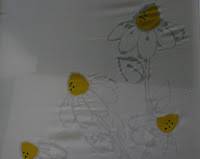 I used a silk habutai scarf, secured in an embroidery clip frame, and drew the design using clear gutta for the outline of the daisies, and black gutter for the seeds. 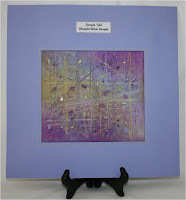 The design was filled in using Setasilk paints in buttercup, iris violet, meadow green, raspberry and azur blue. After I'd filled in the daisies, it looked a bit stark, so I watered down the background fabric, and splodged the silk paints on it, so that they would blend. I then added a few dots of gold Lumiere paint as highlights. Overall not a bad first attempt. A bit fiddly, but I still think I'd try it again. 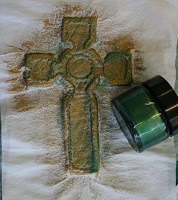 Next challenge was to try transfer printing using liquid disperse dyes. I only had three colours: tomatoe, skye and leaf, so my design scope was a bit limited. I draw this bunch of roses and hoped for the best .... and was pleasantly surprised. It worked brilliantly and the colours on the fabric (polyester satin) came up much brighter than on the paper print. Great fun and easy to do. 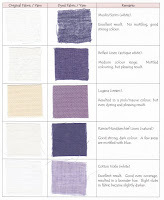 I was disappointed with the Dylon fabric dyeing, so had a go at using Procion dyes. 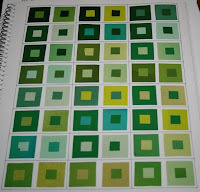 These were much more successful and I got a lovely range of hues and tones. To create the purple colour scheme I mixed Navy, Fuchsia and Cobalt Blue. and for the lime green scheme, I mixed Cobalt Blue with Lemon Yellow. The colours are lovely and not as mottled as the Dylon attempt. 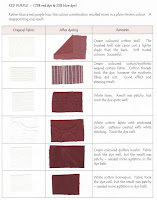 I liked using the procion dyes, even though it was a bit painful and frustrating making up the soda ash and salt mixes. Apart from dyes we were also required to use paints, crayons, felt pens, etc. I liked the Shiva sticks, especially using a stencil or rubbing over a stamp. Easy and quick. 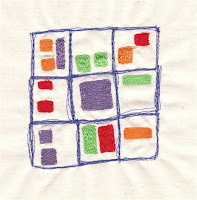 Crayola fabric transfer crayons were also good fun and easy to use. 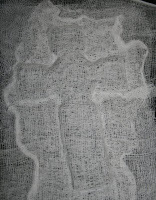 haphazardly and the fabric remained quite soft and fluid. 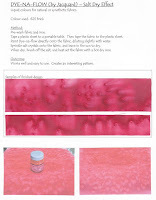 My last sample is a salt dry effect using Dya-na-flow on a polyester satin fabric. This was easy to do and created a great effect, although DH thinks it looks like hundreds of penguins. Dyeing was time consuming and put me out of my comfort zone, but I like the idea of making my own coloured fabrics and will probably continue with it, but just need to build up my stock of dyes and paints (roll on Lotto night!!!!). I've had a little break from C&G for a few days as we welcomed the arrival of our fourth grandchild and third grand-daughter into the world on Thurs 4th June, weighing a healthy 8lb 8oz. Little Lexie Jane Macdonald is as beautiful as every child is, and we're all over the moon! I have been "trying" to do some embroidery ... you'd think 9 months would be enough time (Huh!). This is what I've achieved so far ... the rest are almost complete and will be posted shortly ... guess what I'll be doing the next few days ... stitching, stitching, stitching. 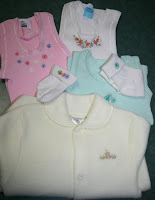 Above is a little soft fleecy jumpsuit that I embroidered bullion rose buds on, and below are a few vests that also have bullion roses, and lazy daisy flowers on. There is a blanket half done, and more vests and jumpsuits to come, as well as a "dangly thing" ... better go and get cracking. This module nearly broke me ... I came very close to giving up, but not because I wanted to, but was pushed to the limit by modern technology!!!!! Module 6 was all about machine embroidery, fabric manipulation and a full working design for an embroidered panel, so a sewing machine was required. My you-beaut super expensive Pfaff sewing machine, only a few years old, and hardly used, just would not work properly. It went backwards and forwards to a service repair man numerous times, many of them delivered by myself which meant extra time driving up and down to the city, along with the cost of repairs only to find after 3 attempts to repair it, that it still wouldn't work. Only after an email to the Pfaff HQ did I get put onto a different repair agent, who eventually fixed it. Turned out to be a faulty bobbin race! In the meantime I'd purchased a cheap Bernadette and started this module on that machine .... it did the trick, but not to the standard I wanted, but beggars can't be choosers. After years of being a traditional hand embroiderer I'm a bit intimidated by free machining, but I just LOVE the style of it, and am sure that I will persevere and hopefully improve. we were required to do a straight stitch sample, with lines running this way and that, crossing over each other, and in various thicknesses, with snippets of fabrics added. My first attempt was created on a hand-dyed (not by me) velvet, embellished with beads and fabrics. I liked the colours but it seemed to get lost and looked insipid .... so I tried again. 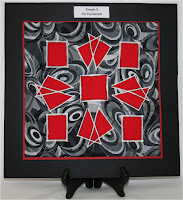 ... this time I used bold red with black, white and grey, on a hand dyed (this time by moi !) calico. 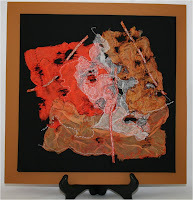 When I mounted it, I extended the design onto the mount board using felt pens. I was much happier with this one. Then onto the zig zag sample. We had to stitch shapes onto 3 layers of fabric, cutting away the first layers (like the reverse applique method). My top layer was patchwork cotton, middle layer was wool blanketing, and bottom layer plain old calico. I found the points in the corners of the triangles difficult to master with the zig zag stitch - again, I need more practice. 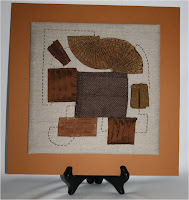 From there we had to do a machine embroidery sample based on one of our shape designs from Module 2. 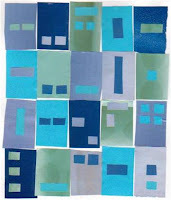 I based this sample on a photograph and subsequent collage (shown below) of a pile of sea containers. Using the Bernadette was not going well .... I just couldn't get the tension right, and the sample ended up puckered, but at least I was able to work on the module ... I'd already lost a month in frustration. 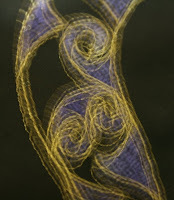 The above sample was based on another of our previous modules ... this is a design from my Viking/Anglo Saxon artefacts. Again the end result was slightly puckered due to the tension being too tight. 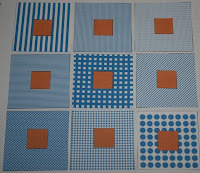 Below are my samples created using water soluble fabric. This was good fun, and I enjoyed this. By this time my Pfaff was back and in good working order so I was feeling much happier! ... and more again. These were using metallic threads. I really like the floral design and can see this as an insert around the neckline or cuffs of a top .... Hhmmmmm, lots of ideas ... just not enough time. Then it was onto Fabric Manipulation .... 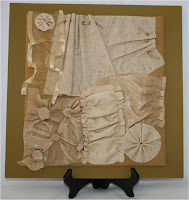 This is my finished and mounted sample of pleating. Not very inspiring, but how to do you jazz up a lot of pleated pieces of fabric ... I tried by using the running stitch to bring it all together and link it up, not sure if it worked or not! I decided to do the tucking sample using all white fabrics, but unfortunately it doesn't photograph that well. 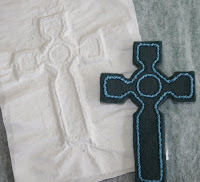 Most of this was done using machine embroidery, but I included one sample on Cashel Linen using pulled thread work. I like the clean look of this one. My gathering sample just didn't hit the mark where I was concerned. I did various samples, but trying to bring it together was difficult ... this is the best I could do. But the burning sample was different. We had to burn lots of different fabrics and test their burning quality and reactions, then use a few of them to create our finished sample. 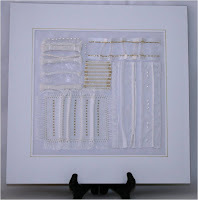 I chose 4 of my burnt sample pieces and brought them together with ribbon and machine embroidery. Hubby is more partial to my hand embroidery work, but really likes this piece, and I must say I'm very happy with it too. A close up of the burnt finished sample. So another module down .... and onto Module 7.